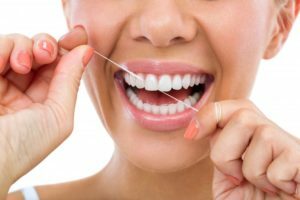 While flossing should be a key part of everyone’s at-home care, most people don’t do it. In fact, many people openly admit it’s too difficult or they don’t have time! However, flossing has been important for centuries. That’s why your dentist in Waverly thought it would be fun to take a dive into it’s history to celebrate Children’s Dental Health Month. From prehistoric humans to today’s modern materials, floss has truly come a long way. So, without further ado, let’s jump right into the timeline of floss. It just might make you appreciate the stuff more during your next time in the bathroom. We still don’t know when floss was first used, but scientists do have evidence that floss existed in prehistoric times. Apparently, grooves from floss and toothpicks were found in the mouths of prehistoric humans, suggesting they used tools to remove food debris from their teeth. Researchers believe these tools consisted of horse hair and twigs. Honestly, your dentist in Waverly was surprised to hear about it. It wasn’t until about 1815 that floss started to have more dedicated research and development. An American dentist by the name of Dr. Levi Spear Parmly introduced the idea of using waxed silken thread to remove plaque and food debris after brushing. He eventually published a book titled A Practical Guide to the Management of Teeth, which discussed how brushing and flossing daily could make a big difference in your oral health. For context, the American Dental Association wasn’t even established until 1859. Eventually, larger companies started taking notice of it’s use. In 1882, the Codman and Shurleff Company began mass-producing floss, but a patent for floss had still not been adopted. That is until 1898, when another company known to this day as Johnson and Johnson was granted the first patent for floss. By the time World War II started in the 1940s, the cost of silk began to increase. This made it difficult for companies to acquire it for floss. As a compromise to using the easily shreddable material, companies used nylon instead. This was credited to Dr. Charles Bass, another researcher and medical doctor who was noted for making flossing an essential part of daily oral hygiene. To make removing floss easier, the first interdental toothbrush was developed. To this day, people still use it to clean hard-to-reach areas of their mouth. Without floss, we wouldn’t be able to protect our teeth as well as we could. That’s why your family dentist in Waverly always provides them after your regular dental visit. Schedule an appointment today to keep your oral health in check! Smiley Family Dentistry understands the importance of preventive care and regular at-home maintenance for your teeth. That’s why we recommend you visit every six months and take advantage of our cleanings, nightguards, dental sealants, sportsguards, and oral cancer screenings. To learn more about the practice, contact us at (319) 352-2270 or visit our website.